The other day on my Tumblr, I reblogged a set of images featuring “pet animals” on one side and “food animals” on the other, with the statement “Why love one but eat the other?” in the middle. They were from billboards that ran in Toronto a couple of years ago. The message, of course, is that we shouldn’t eat chickens, pigs, and cows because they’re animals just like puppies and kittens are; it’s an attempt to turn people to vegetarianism or veganism. Because generally speaking herbivores taste better than carnivores. Also, we’ve spent centuries selectively breeding cows, pigs, and chickens to be meatier and tastier, while we haven’t done that with cats and dogs. And it’s easier to raise herbivores as food behaviorally, especially because we have bred them to be more docile. And it’s also cultural. There have been and still are cultures in which dog and cat meat is acceptable; it’s just that in Western cultures, where this sort of ad campaign pops up, it’s not acceptable. If you talk to anyone raised on a farm, though, you know that farm kids are raised with the idea that some of the animals end up as food, and that you can be attached to them and care for them and still accept that fact. If they’re from a hunting family they often learn that the same deer they hunt are also beautiful animals that can be admired, and this doesn’t have to be a contradiction. On a farm, you’re closer to life and death than people who shop at the grocery store and have never raised their own meat or gone hunting. I didn’t grow up on a farm itself, but I grew up in a rural area with lots of farms, and with the reality that if I am going to eat, something has to die, whether animal, plant, or fungus. I have had people ask me before, “How can you say you love animals when you have dead ones all over your home? How can you appreciate them when you support killing and eating them?” Simple: like those farm kids I went to school with, I understand that death is a reality and an inevitability, but that doesn’t mean that’s the only thing that defines my relationships with other living beings. Just because my existence is going to directly lead to the deaths of certain animals doesn’t mean I can’t have empathy for them and want them to have the best lives and cleanest deaths possible. I support both strict regulations in the care of domestic animals in homes and farms, and strict penalties for animal cruelty. I also support the protection of wildlife; I follow regulations surrounding animal parts as carefully as I can, and beyond what I need to cover personal and business bills I’m able to donate some money to animal-based nonprofits. And I appreciate all of these animals both in life and death. I am ever grateful for wildlife sightings, urban and rural; the birds outside my apartment make me incredibly happy, and on the occasions I’ve seen a coyote or Douglas squirrel when out hiking, it’s been a highlight of the trip. 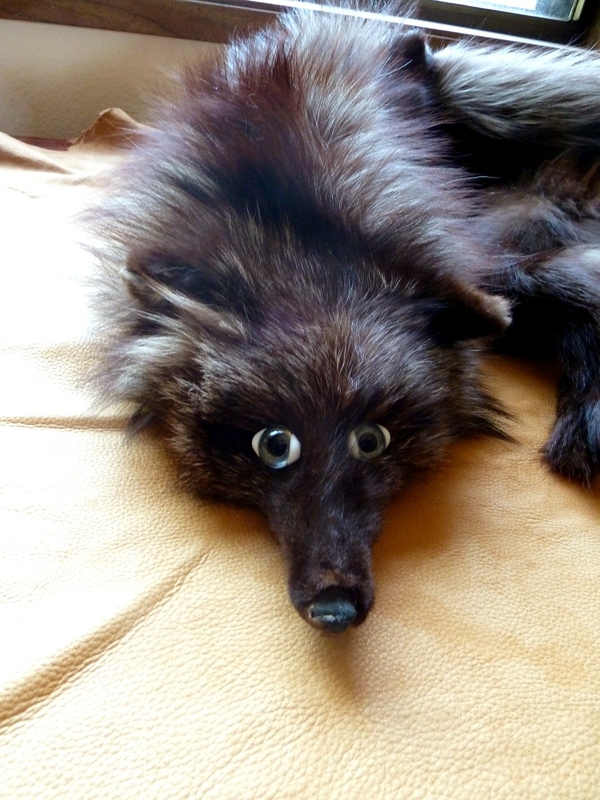 But I also enjoy the beauty of well-crafted taxidermy that captures the grace and form of the animal when it was alive, and I’m fortunate to know some incredibly skilled taxidermy artists who are similarly appreciative of the wildlife whose remains they’re preserving. In a similar vein, I love how intelligent pigs are, I know what good pets chickens can be, and I think Highland cattle are one of the most adorable species of critter known to this world. But I am also grateful that I have relatively easy access to beef, pork, and chicken and the protein therein that keeps me going. If anything, my appreciation for these beings when they’re alive makes me more mindful of their remains once they’re dead, as well as the processes by which they went from life to death. Is it hypocritical that I do eat pigs and cows and not dogs and cats? Perhaps. But just about everyone has some discrimination as to what animals will be harmed and which will not in order for them to continue living, and making a living. There are dead critter artists who limit themselves to vintage furs, roadkilled bones, and other relatively cruelty-free remains, but who will still happily scarf down a steak made from an antibiotic-stuffed cow that lived in a crowded stockyard and died badly in a factory farm, and eggs from a battery hen in a tiny cage. There are vegans who refuse to eat or wear anything that came directly from an animal, but who wear petroleum-based synthetic fabrics whose manufacture led to the deaths of countless animals through oil spills and factory pollution. Are these bad people? I don’t think so. There are very few people (thankfully) who actively want animals to suffer, and a lot of the rest of us would prefer that animals, even those we kill, were well cared for in life and death. Continuing public awareness campaigns help people to be more informed, even if they aren’t currently in a place where they can, for example, buy only free-range meat or raise backyard chickens for eggs. There needs to be a variety of solutions to match a variety of personal situations. Does that mean you should give up veg*nism and eat all the animals? Of course not. Nor does it mean that we should try to change American and other cultures to make dog and cat meat more acceptable. What it does mean, though, is that the above questions do have different answers, and a lot has to do with a person’s background and experiences in life. It’s not a simple situation. I know, I know–there will be people who see this and say “Yes, it IS simple–don’t kill animals, period!” To that, I am going to have to agree to disagree for a variety of reasons. It is almost impossible to live a life that does not end in the deaths of other living beings, animals included. If your aim in life is to reduce the number of animal deaths as much as possible, then I wish you the best in it, and I respect you for it. But there are those of us who do to one degree or another have to and/or choose to benefit from the deaths of non-human animals, and our solutions to ethical conundrums may be different. I do agree there are plenty of people who aren’t mindful of where their meat and leather come from, and maybe they’d go veg*n if they really thought about it. However, the assumption that anyone who eats meat and other animal products, or who is a leatherworker or taxidermist or similar artist, or who otherwise uses animal products–the assumption that we obviously haven’t thought the issue through enough, that we lack compassion, that we love animals less than a veg*n? I don’t agree with that, and neither would many of my omnivorous/leathery/etc. companions. Just because someone’s stance on an issue isn’t as extreme as yours doesn’t mean they’re acting from a place of ignorance, and I feel this fallacious argument in general is a big error in the discourse surrounding a lot of controversial topics. Really, what I’d love people to take away from this is the idea that each person has their own relationships with the non-human animals we share this world with, whether they’re members of Pheasants Forever or PETA. And those relationships can’t be minimized to single sound bites; each one is the product of a unique lifetime of experience and thought and emotion. I feel this is a crucial thing to remember if we’re going to do anything other than argue and throw up defenses against each other. Even if we don’t agree on everything, we still have the potential to learn from each other, and at the very least have a more civil discourse over a complex, sensitive issue that affects far more than ourselves. I haven’t celebrated the cross-quarters (Samhain, Beltane, etc.) in years, and I generally don’t do purely celebratory ritual unless I’m invited to it (such as Pagan Pride Day rites and so forth). Additionally, I’m two days out from vending at OryCon this weekend, and since I spent a large portion of October too sick to work (thank you, food poisoning), I’m working hard to create enough new things to make my booth a place of all sorts of furry and feathered and beaded creations to take home. That means today was predominantly a “hide in the art studio and pretend the rest of the world doesn’t exist” day. Except I can’t forget the rest of the world exists. My apartment is festooned with bits and pieces of wood, stone, and other organic findings from hikes and explorations, reminders of where I’ve been and where I’ll visit again. I almost always have documentaries about nature, human history, modern technological advancements, and the like going on while I work. Even when I’m holed up in my apartment for days, I never forget that there’s so much more outside those walls. And then there are the dead critters. One of the perks of my art is that I get to work with the remains of animals from all around the world. So I have these constant reminders of the diverse ecosystems that have developed over thousands of years. I’ll probably never get to pet a spotted hyena or a Geoffrey’s cat in the flesh, but I can at least touch and examine bits of their fur as I stitch them. I am also constantly reminded that these were once living beings who met their deaths largely at human hands, one way or another. These deaths often are terrifying, even when they’re relatively quick. Yes, death is a constant threat in the wild, and many of the wild animals whose remains I work with might otherwise have had a much worse death than a quick bullet–starvation, disease, infected injuries, or death in the jaws of a predator. But that does not remove our responsibility to make the deaths we cause be as humane as possible. No animal enjoys dying, and this reality must be remembered. Even the gentlest death is still a living being suddenly being permanently deprived of its ability to interact with this world. The afterlife is not a fact, only a speculation, and it is small comfort to say “perhaps its spirit still roams”, when the only life we know for sure exists has come to a close. Even as I work with the skin spirits in my art and practice, I know that there’s a good chance that these, and all other spirits, are simply emanations of the human imagination, and that this life is all we get. Even if there is an afterlife of some sort, the fact remains that a living being has lost its vehicle for interacting with this wild, amazing world we live in. This is a loss of which we can be absolutely sure, and it is no small thing. This–this is the foundation of my work with animal parts. My work with the spirits for the past fifteen years, developed through trial and error and experience, self- and spirit-taught–this is the heart of my artwork. The aesthetics and the flow are important, and yes, the ability to pay my bills is convenient. But from the time I picked up my first fox faces and deerskin scraps so many years ago, the spirits I discovered in them, and the stories of their lives and their deaths, have been the reason I do this work. Every piece of art I make with fur and bone, leather and feather, is a piece of funerary art. 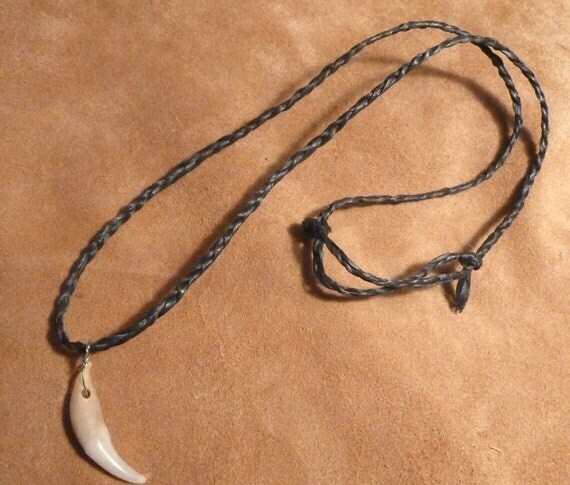 Even the simplest claw necklace or tail is a testament to the animals who once wore the remains, every bit as much as an elaborate bone ritual knife or whole-hide totem dance costume. I think sometimes I take for granted that people realize that. And yet it’s more often that people recognize it in the bigger, more obviously “sacred” ritual tools, and I have to remind them that every little bit, even the snippets and scraps I use as pillow stuffing, is just as sacred and special. Skin spirits and sacred remains: the crafted archetypal memory, and the physical memorial. These are inextricably tangled together in my work and my practice. Hence the prayers and rituals that go along with the stitching and the painting. For me, it would be unthinkable to treat these remains as mere “materials” to be used. These beings once lived, and those lives deserve to be honored and celebrated through my art and ritual. As I sit here on the cusp of Samhain Day*, once I finish my break and return to my work, I will continue with the ongoing, daily rites and practices that honor these beloved dead. And these rituals aren’t just to honor the dead, but to remind me to protect the living. My partner tells me his favorite part of my work is the alchemy of taking the remains of the dead and turning them into money I can give to protect the living and their habitats. It is not only my own mortality I have to remember, but that of every other living being sharing this planet with me. Therefore, please do not mistake the work with skin spirits and sacred remains as one focused merely on death. Death is only the most obvious element of this work. Through my art and spiritual practice I have gained a greater appreciation of the long parade of beings that have come and gone on this blue-green planet, and for the urgent need we have to preserve the balance that our species has endangered so greatly. The spirits remind me of my mortality, but they also remind me I am still very much alive. Perhaps the greatest honor I can do these beloved dead is to make the most of this life, not just as an isolated individual, but as a part of the great, tangled, interconnected web of life, death, and rebirth that we all have had our time in. I am in a small town in Missouri, the place that I grew up in. It’s been a trip of many revived memories, as my mom dug a whole bunch of my childhood belongings out of a storage space in my old room, and I’ve been going through the bittersweet process of sorting through everything, deciding what mementos to keep, and which to let go of as resources to send back into the cycle. So I’m already in a mindset deeply tied into my life as it was over twenty years ago. Which meant that when I drove to the little patch of woods by my old house that I explored so much when I was still in my single digits, finding that it had been entirely leveled and replaced with a brand new building was an arrow to my heart. I am still in shock, and so disbelieving. I feel I’ve lost a long-time friend, perhaps one that I lost touch with as I moved away, but never forgot entirely and visited when I could. And I never got to say a proper goodbye. I had no idea that the last time I visited would be the very last. I know, I know. I get that the fact that this place stayed “undeveloped” as long as it did, in a podunk little town pretending it’s a big city, was pretty impressive. It’s actually the second place that I’ve seen destroyed. The woods behind the house we lived in next, and that I am visiting now, was almost entirely removed for a housing development. The spirit there still lives; much-diminished, and much more jaded, it still lives in the remnants of the woods that flank the artificially widened creek that sluggishly meanders through as best as it can. And that destruction happened over fifteen years ago, when I’d only had a couple of years to connect with the spirit there. That experience, coming home on the school bus one day to find all the trees save for a few down and shattered–that was a horrible introduction to adulthood, and it really was where my childhood came to an end. Today, even those old wounds pulsed achingly. I am still angry. I haven’t “gotten used to it” or “grown out of it”. And I feel isolated as I sit in a place where most people wouldn’t understand why I’m so deeply hurt by this loss. I’ve already been told “Oh, but the pharmacy people are so nice!” and given the attitude of “development happens, get over it”. Invalidation after invalidation. And it hurts, it just hurts so much. That place? It taught me the joy of the outdoors, the fascination with other species, and my place as a human animal. It was my refuge when I began to experience bullying at the age of eight. It was my first minor rebellion, as technically I wasn’t supposed to be over on that side of the hill. But mostly it was a place where I could allow myself to explore, both the physical landscape, and my imagination. I wasn’t just a little girl in a pink coat wandering through the brambles and trying to avoid poison ivy. I was a wilderness seeker, living in a little cabin in the woods. I was a wolf, hunting rabbits in the tall grass. I was a snake basking on a big rock. I was so many things, each time I sneaked through the narrow pathway in the poplars and into the trails around the cedars. I spent so much time in that place, that little maybe-half-acre of scrub woods, and now–now I can never walk there again. All I can do is hope that the few pictures I took on my last visit, two years ago, are still on my old laptop, that I can have a little more visual aid to help strengthen my memories in the wake of seeing this horrible shift. Underneath the foundations of that building are the remnants of root systems from scraggly cedar and poplar trees that I hid among when I was young. There, too, are the nesting sites of Monarch butterflies, quite possibly relatives of the one that I watched in its chrysalis every day for two weeks until it emerged one spring day. And there lie the bones of the garter snakes and box turtles that were descendants of the ones I would catch, observe briefly, and release. There are stones that I stood on, lifted up to explore the life hiding underneath–snakes, crickets, centipedes, and more. I won’t go back this trip. I won’t go back to try and find any last remnants of my place. I can’t bear it. I know I shouldn’t hold it against the new spirit of this place that is just being born. All places have spirits, including built-on ones. And I’m sure the pharmacy building now there will develop its own spirit over time. But it’s not my place. The spirit of the place I knew is dead. Gone. Living only in my memories, and maybe in the remnant memories of a few other people who saw it as more than just an open lot. All I have left is one single pine cone. I was going to go back at this trip and collect a few more mementos. I’m glad I have the one that’s left. It’s on my place altar. I hope it can stay safe there. It’s my last physical connection to the place that had so much meaning for me. When I get home, when I can get back to that pine cone on my altar, I’ll spend some time looking for the pictures on my computer, and put together a mourning ritual to help me grieve. I’ll wait until I get back to a place where I know my anger and my sadness will be respected for what they are, instead of having them minimized and invalidated. I’ll go to where I can be safely held in my hurt, and remember the place that held me when I hurt so many years ago. Until then, it’s not “just a place”. I’m not just “making a big deal out of nothing”. I have to remember that. I can’t let my grief be derailed by others’ expectations of how I should feel or what should be important to me. I spent too much time living up to the expectations of others, and I’ll be damned if I deny my hurt any longer for a place that formed me in ways no human being ever did.